The Mid-Hudson Alumni Chapter got together at Hyde Park Brewing on Sept. 22. Recent activities: Alumni enjoyed a pregame reception at Pinhead Susans and a men’s hockey game as the Tigers took on Union Oct. 23. Coming up: Plans are under way for an alumni event this winter. Please check the website for details. Coming up: Plans are under way for an alumni event at Sweetwater Brewing Company this winter. Please check the website for details. Recent activities: Alumni enjoyed a cooking class at Whole Foods on Oct. 18. Coming up: Plans are under way for an alumni event this winter. Please check the website for details. If you are interested in becoming a chapter volunteer, please contact Candi Boston at cabalum@rit.edu or at 585-475-4279. Recent activities: Alumni enjoyed a reception and night of bowling at Lucky Strike Lanes in Jillian’s of Boston Oct. 26. Coming up: On Jan. 22, RIT alumni, family and friends are invited to a pregame reception and game as the men’s hockey team takes on Holy Cross in Worcester, Mass. Please check www.rit.edu/alumni/boston for details. Recent activities: On Sept. 25, alumni and guests enjoyed a train excursion aboard the Vineyard Express, with stops at Spring Lake Winery and the Medina Railroad Museum. Thank you to host Tom Stumpf ’89. Alumni also are scheduled to cheer for the RIT men’s hockey team as they face off against Niagara Nov. 24 in Dwyer Arena. Recent activities: Alumni got together at the Melting Pot in Melbourne for a fun evening of fondue on Nov. 9. Alumni and guests enjoyed a performance of the new musical Bonnie & Clyde at the Asolo Theatre in Sarasota on Nov. 16. Coming up: Plans are under way for an alumni event this winter. Please check the website for details or contact Candi Boston at cabalum@rit.edu or 585-475-4279. Coming up: Plans are under way for an alumni event this winter. Please check the website for details. If you are interested in becoming a chapter volunteer, please contact Dan Christner at dan.christner@rit.edu or 585-475-4893. Recent activities: Alumni and guests are scheduled to enjoy a beer sampling at Great Lakes Brewing on Nov 30. Thanks to host Al Teufen ’73. Coors Field as the Colorado Rockies took on the L.A. Dodgers Sept. 28. Thank you to hosts Dave Belden ’04 and Jennifer Wicus ’04. Men’s Hockey Coach Wayne Wilson joined alumni on Nov. 7 for dinner before the hockey team faced Air Force. Coming up: Plans are under way for alumni events this winter. Please check the website for details. Recent activities: The Office of Alumni Relations held alumni gatherings at Citrix and Harris RF as well as a luncheon for those working in the Linden Oaks corporate park in Rochester. 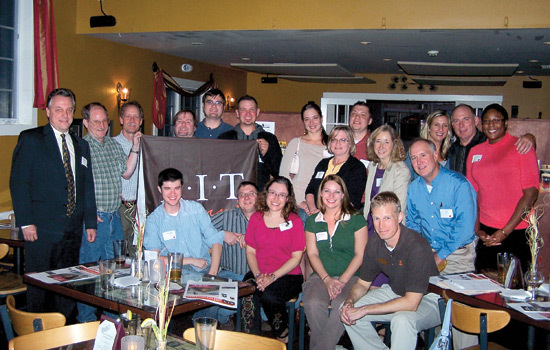 Coming up: If you are interested in planning an RIT alumni event where you work, please contact Jon Rodibaugh at jprrar@rit.edu. Recent activities: Alumni and guests enjoyed a night of hometown hockey as the Dallas Star took on the Buffalo Sabres on Oct. 30. Thanks to alumni host Scott Saldinger ’91. Coming up: Plans are under way for alumni events later this winter. Please check the website for details. Coming up: RIT alumni, family and friends are invited to watch the hometown Detroit Red Wings Dec. 6 take on the San Jose Sharks at Joe Louis Arena. Please check www.rit.edu/alumni/detroit for details. Recent activities: On Sept. 15, alumni and guests gathered for dinner at the Lalit Hotel in Delhi. Coming up: Plans are under way for alumni events this winter and spring in Mumbai and Delhi. Please check the website for details. Coming up: Plans are under way for a cooking class this winter. Please check the website for details. Coming up: Plans are under way for an event this January. Please check the website for details. Recent activities: On Sept. 22, alumni and guests gathered and sampled beer and took a tour of the brewing process at Hyde Park Brewing. Coming up: RIT alumni, family and friends are invited to cheer on the RIT men’s hockey team Jan. 8 as they take on Army in West Point’s Tate Rink. Go to www.rit.edu/alumni/midhudson for details. Coming up: Plans are under way for alumni events this winter. Please check www.rit.edu/alumni/ mumbai for more details. Recent activities: On Sept. 12, alumni and guests gathered for a night at the U.S. Open Men’s Tennis Championships. Thank you to Mike Larson ’93 for hosting this event. Coming up: RIT alumni, family and friends are invited to cheer on the RIT men’s hockey team Jan. 8 as they take on Army at West Point’s Tate Rink. Please check www.rit.edu/alumni/midhudson for details. Coming up: Watch for details on a Philly Food Tour in February. Please check the website for more information. Coming up: Come cheer on the RIT men’s hockey team as they take on Robert Morris at the Consol Energy Center on Dec. 30 as part of the NHL’s Winter Classic festivities. An alumni reception will take place before the game. Recent activities: Alumni enjoyed a night of hometown hockey as the Carolina Hurricanes took on the Philadelphia Flyers Nov. 11. Coming up: Another night of Hurricanes hockey is scheduled for RIT alumni March 1 as the hometown team takes on the Florida Panthers. Please check the website for details. Recent activities: Alumni and guests enjoyed a bus trip to Skaneateles for the Mailboat Tour & lunch at the Sherwood Inn on Aug. 18. Alumni and guests gave back to their community on Sept. 11 by volunteering at Foodlink. Special thanks to all alumni and guests who participated. RIT alumni had a fun evening of bowling and chicken wings at L&M Lanes on Sept. 29. Thanks to hosts Steve Gesinger ’77 and Maggie Reilly ’04. Alumni and guests enjoyed a bus trip to Niagara-on-the-Lake for the annual Shaw Festival on Oct. 5. On Oct. 6, RIT alumni and guests gathered to watch a special screening of the award-winning Tour de France documentary Chasing Legends by alumnus filmmaker Jason Berry ’92. Alumni enjoyed a performance of A Chorus Line at the Auditorium Theatre on Oct. 8. A “spiRITed” group of alumni went on the Landmark Society’s annual Ghost Walk on Oct. 23. Special thanks to alumni hosts Sharyn Duffy ’87 and Susan Shanks ’97. Also on Oct. 23, alumni and guests enjoyed a day of Native American culture at Ganondagan State Historic Site. Alumni and guests enjoyed a vintage train trip and wine tasting on the Finger Lakes Railway on Nov. 6. Special thanks to alumni hosts Fran Versace ’08, ’09 and Rita Haschmann ’79.Alumni enjoyed a performance of Young Frankenstein at the Auditorium Theatre on Nov. 12. Coming up: Registration is now open for a variety of alumni events. To view the most current calendar, go to www.rit.edu/alumni/rochester. Recent activities: On Oct. 16, alumni and friends enjoyed Oktoberfest Napa Valley at the Napa Valley Expo. Thank you to host Mark Leonardi ’94 for making this possible. Coming up: Plans are under way for a Seattle Sounders game this spring. Please check the website for details. Recent activities: Alumni and friends participated in the annual ROCS (Reaching Out for Community Service) day at The Caring Kitchen in Delray Beach on Sept. 11. Alumni also gathered at The Melting Pot in Ft. Lauderdale on Nov. 8 for a fun evening of fondue. Coming up: Plans are under way for an alumni event this winter. Please check the website for details or contact Candi Boston at cabalum@rit.edu or at 585-475-4279. Recent activities: On Sept. 25, alumni enjoyed a beautiful cruise on Skaneateles Lake with dinner from Doug’s Fish fry. Coming up: On Jan. 15, alumni, family and friends are invited to a pregame reception and Syracuse men’s basketball game against Cincinnati. Please go to www.rit.edu/alumni/syracuse for details. Recent activities: On Sept. 19, alumni enjoyed the fall beauty of the Adirondacks aboard the Adirondack Scenic Railroad for a Fall Foliage and Wine Tasting Tour. Coming up: Plans are under way Feb. 18 for a pregame reception at a RIT men’s basketball game. Please check the website for details. Recent activities: RIT alumni watched the Washington Capitals take on the Buffalo Sabres in a thrilling match on Nov. 17. Thanks to host Jose Padin ’03. Coming up: Alumni, family and friends are invited to a reception and live streaming of the men’s hockey game Jan. 29 against Mercyhurst at Clyde’s of Gallery Place. Please go to www.rit.edu/alumni/washington_dc for details. 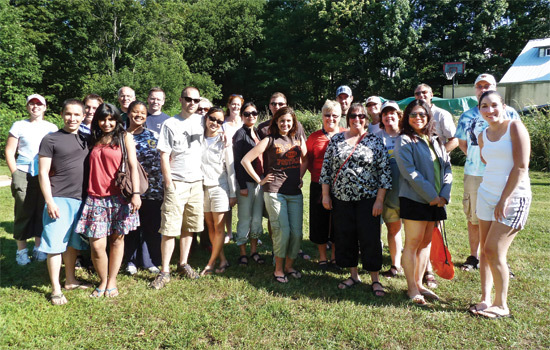 Alumni pose for a quick picture after braving the rapids on the Salmon River in Pulaski, N.Y., on Aug 7. Thank you to host Frank Lucas ’75.